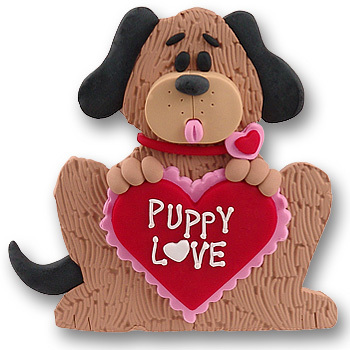 From Deb's Puppies & Kittens collection, this "Puppy Love" Puppy Dog ornament is ready for Valentine's Day and ready to tell you just how loved you are. This ornament makes a great gift for anyone near and dear to you. The "Puppy Love" Puppy Dog is an ornament and comes complete with a hook and red satin ribbon for hanging. Designed by Debi Allison and handmade from Polymer clay. It is very detailed. Even the words "Puppy Love" are handcrafted from clay. COLORS CANNOT BE CHANGED AND NOTHING CAN BE ADDED OTHER THAN THE PERSONALIZATION SO PLEASE DON'T ASK.